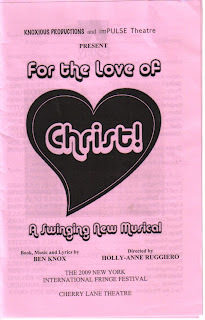 Ben Knox wrote the book, music and lyrics for the new "swinging" musical, For the Love of Christ! He also stars in this FringeNYC show. It's his attempt to teach the hypocritical religious a lesson on living and letting live. He does a fine job with it too, much to the credit of the very even, clever and swift moving direction by Holly-Anne Ruggiero and cast, not afraid of having over-the-top fun. For the Love of Christ! is the story of a closeted gay and unhappily married man named Charlie (Knox) with a very religious wife (Kristy Cates) and two confused teenage children (Eryn Murman [one hell of a surname] and Jamaal Wilson) in 1979. Following his curiosity and the hunky French Canadian airline steward Jésus (Dan Amboyer), he ends up at a bathhouse, run by Dante and Pauly, a very funny duo (Eric Rubbe and Steven Strafford respectfully, and they steal every scene!). Bringing condemnation on the whole thing, and being even more hypocritical, is the Reverend Father, sort of a combination evangelist preacher/Catholic priest, played by Marty Thomas, who has an affair of his own with the wife. While the story doesn't always make sense, it's a silly, dirty romp of a great time. There are a few misses - the Reverend Father has a penchant for altar boys - something that wasn't really so in know back in 1979. It also only touches the edge of the consequences of random liaisons in gay bath houses, which is perhaps too serious to tackle in this campfest. Knox doesn't hold back on punches and sometimes it's quite offensive to Christian sensibilities, but there's truth behind the jokes as well. However, with its nicely arched but highly campy score, it's mostly reminiscent of a full length Forbidden Broadway sketch and never overdoes the "holier than thou" theme. The anthem-like "Get What You Want," a preachy tuner in the vein of the traditional musical theatre anthem (think La Cage), was the highlight of the score. The vocals of the cast are mostly great too - it's always fun to hear the soprano rise above the rest of chorus, and of course, Kristy Cates has no trouble delivering on these notes. Also particularly fun was the choreography by Holly Cruz, with its nod to traditional chorus dancing and soft shoe, complete with a very funny dream ballet in the final scene. Overall it's a tightly run show, with an efficient set, and laughter comes easily. The Cherry Lane was packed with an appreciative audience on Wednesday night. There are three more times to catch this romp: Fri 21 @ 5, Mon 24 @ 3, & Fri 28 @ 7. Tickets are available via www.FringeNYC.org.